The Craft Barn alpha/dictionary challenge is asking for A. I chose a fish from my wildlife encyclopedia. Actually in Finnish (and obviously many other languages too) this is a pineapple fish... for obvious reasons :) Besides the Craft Barn challenge I'm posting for the Country View challenge (stencils). 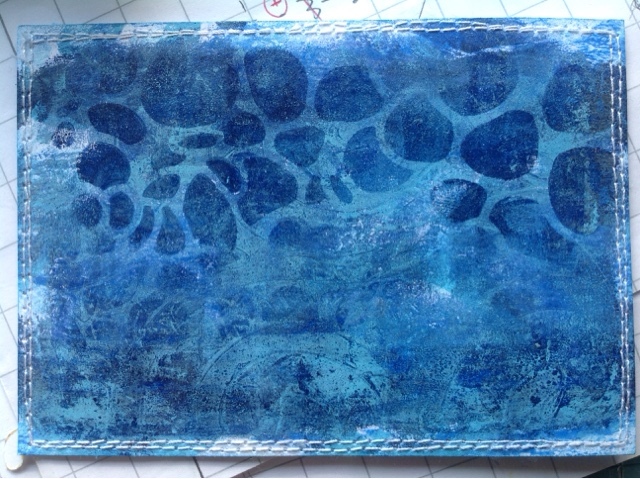 I have been gelli-printing lately, and decided to try using my gelliplate and some stencils for the background. After several layers, the result was ok... and since all my previous alpha cards have sewed elements, I added sewing around the edges (though this time there was actually nothing to sew onto the card. 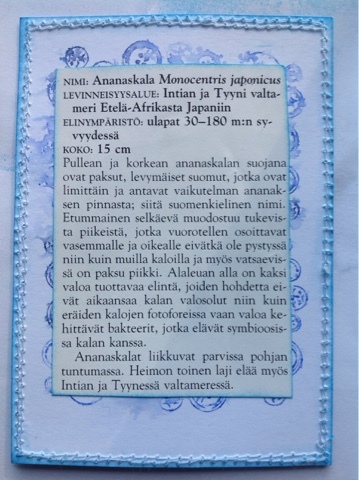 Here is the other side of the card with a description of the fish. I checked youtube and found this nice video that shows how spiky the little fellow is. Must be a lovely find for a diver, quite a stunning fish. This fish is nocturnal, hiding most of it's day and moving more actively by night. It leads a symbiotic life with some bioluminescent bacteria that live in pouches under it's lower jaw... perhaps the light helps to lure food. The first finn on the back is mutated to separate strong spikes that turn to left and right instead of rising upward. The letter A and the button background are From Rubber Dance Stamps. WOW, this is incredible. And of course, the sewing always adds that extra special bit of interest, whether it attaches anything, or not. Your use of the gelli is super. Love the background and your beautiful fish. Fabulous background and fish although he does look angry for some reason! Great background, and that looks like a scary fish! 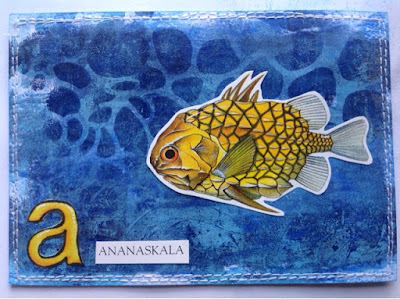 Lovely Gelli print background on your card, it works so well with your bright yellow fish. Pretty little card! I love the story of the little fish, very intersting! Your background looks great! Thank you for joining us at Country View Challenges! Have a nice week! The background has the feel of movement and is a perfect backdrop for the fish. 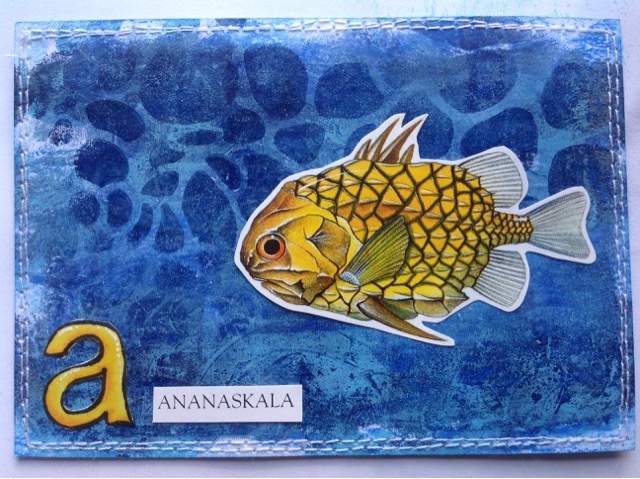 A truly beautiful fish, with a lovely name too! Thank you for entering The Craft Barn Challenge.